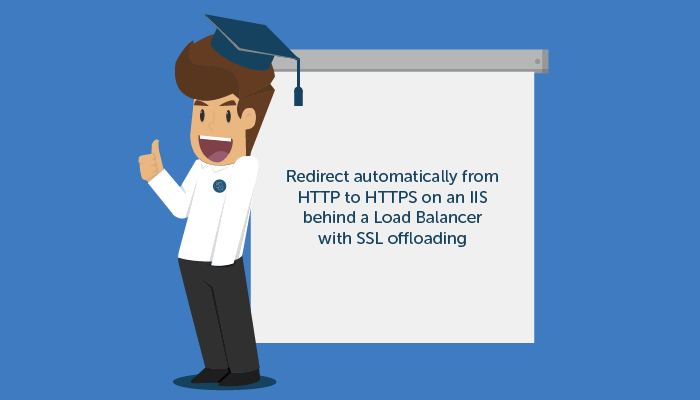 Im Durchschnitt wird dieses Tutorial Redirect automatically from HTTP to HTTPS on an IIS behind a Load Balancer with SSL offloading mit 5 bewertet, wobei 1.0 die schlechteste und 5.0 die beste Bewertung ist. Es haben insgesamt 2386 Besucher eine Bewertung abgegeben. An automatic redirect from HTTP to HTTPS refers to the automatic forwarding off HTTP to the secure HTTPS protocol on port 443 in case a request should arrive at the unsecure HTTP protocol on port 80. Although the IIS can deal with HTTPS, HTTP requests are consequently ignored. Hence, it’s not suitable for a public webpage, since very few visitors go through the effort of entering the URL manually with https://. Furthermore, search engines or other website crawlers will only work if the corresponding service stores the https-version of the link. In order to remedy this, you can configure an automatic redirection on the IIS, which turns HTTP requests into HTTPS requests. If the IIS is behind a load balancer with SSL offloading, such as the free load balancer from gridscale, configure your load balancer and your IIS as described in this tutorial. If the website is operated without load balancers and SSL offloading on an IIS, use this Tutorial (German only) since the process may be different. Configure your Load Balancer so that port 80 and port 443 both point to port 80 of the target computer. Then equip the HTTPS redirection with an SSL certificate, for example from Let’s Encrypt. Note: To edit the port, you must switch to expert mode. Then log on to your web server via RDP as administrator and, if not already present, install the extension “URL Rewrite“. You can download it here. Switch to the root directory of your website and open the file web.config in an editor of your choice. I recommend Notepad ++. This free text editor automatically detects line breaks and syntax errors. Paste the following code into the file and then save it. Reboot your web server once more using the IIS and test if your request is automatically redirected when you open http://<yourdomain>/ in a browser of your choice. With these simple steps, you can can create your own redirection of HTTP to HTTPS behind a load balancer with SSL offloading. The use of HTTPS contributes significantly to the protection of communication, since the queries are encrypted. So it is recommended to redirect all HTTP requests to HTTPS. If you run your IIS without a load balancer with SSL offloading, you can view this article (German only). Übrigens: kennst du schon unser Tutorial zum Thema Resize your gridscale Storage on-the-fly on Windows Server 2016?